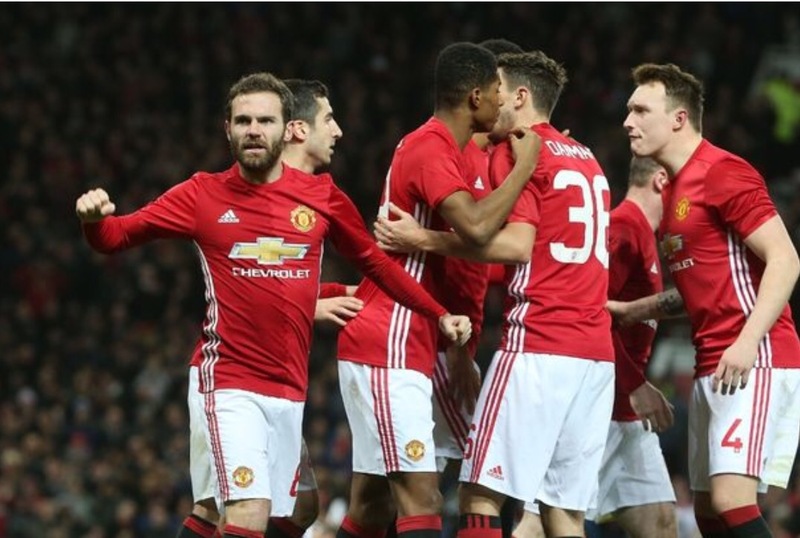 Manchester United recorded their 9th consecutive win in all competitions on Tuesday night when they played Hull City in the EFL Cup semi-finals. This is a feat United haven’t afforded since the 2008/2009 campaign when we went on an 11 games winning streak. The team continues to play with a passion and hunger that has been absent from Reds since the departure of Sir Alex Ferguson in the 2012/2013 season. The team fielded for the Cup semi-finals had 7 changes but was by no means a fringe team though it lacked the presence of players like Ibrahimovic and Marcus Rojo. Marcus Rojo was sidelined due to a muscle injury he got from the match against Reading, meanwhile ‘the match missed Ibrahimovic’ because ‘he had to go afflict some illness’. Luke Shaw remained out of the team, probably still due to illness, while Schneiderlin and Memphis are as good as gone. This match looked to be the record breaker match for Wayne Rooney as he chased the 250 goal mark to no avail. On the flip side he did little of his total team play, the usual Rooney that covers every ground of the pitch and ‘sacrifices’ himself for the team was absent; that one thing Jose Mourinho praised him about before this match. Carrick’s absence in the line-up made this have a much deeper effect on the performance of the midfield. With Rooney practically playing as a striker he was way too high up the pitch to be able to string together decent passes with ‘Porrera’ (Pogba and Herrera) thereby encouraging both players to drift upwards. With Carrick absent, United struggled in the first half to transition from defence to attack especially since Porrera seemed to move too high or too wide in the midfield. It sometimes took Smalling and Jones to drive into the middle to get a decent pass forward. If Rooney was the first domino piece in this faulty play, consider Darmian to have been the most likely one at the end. The defender was an absolute liability at the back, giving wingers too much space to cross, but was more of a threat on the other end. This is how it affected play; it was either United were attacking (mostly) or Hull were the ones trying to nick an early goal themselves. Think of it as some sort of ‘seesaw’ game with United the heavier kid. It wasn’t until Henriksen, Hull’s winger that tormented Darmian, had to be subbed off with an arm injury sustained from a collision with Pogba did the game tilt in United’s favour. He was replaced by an attacker, Abel Hernandez, which allowed United’s midfield regain its bearing. At this point Hull had already narrowly missed a chance when Diamonde’s ball hit the bar. On the attacking end Juan Mata showed beauty in his touches and intuitive dribbles, himself and Mkhitaryan were be a little too slippery for the defence to handle. 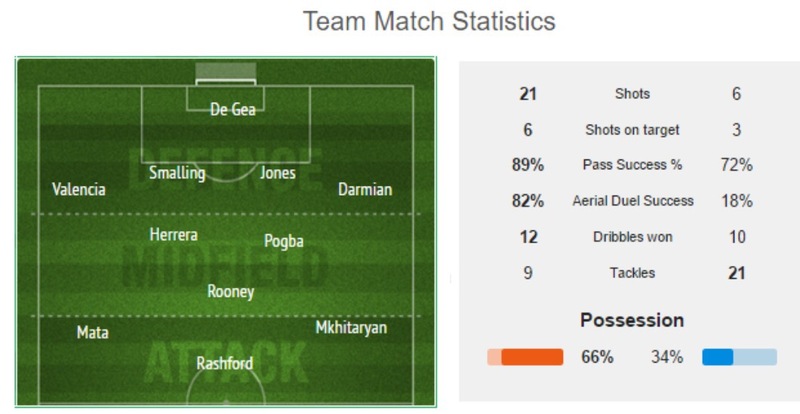 Add to that Rashford’s (Rashidi from here on, idc) pace, Rooney’s aggressiveness, Pogba’s trickiness and long distance threat, and the bursting runs of Valencia and Darmian; which led to a goal each. Although going into half time a little flat the team came out better than the first. A balanced midfield play, defence more solid and attacks in waves. Juan Mata was the man who put United ahead in the 56th minute, netting Mikhi’s header from a cross by Antonio Valencia. Pogba was denied by the bar on several occassions while Rooney, Rashidi and Mkhitaryan were constantly unlucky as the game went on. Rooney, Mkhitaryan and Mata eventually came off for Martial, Lingard and Fellaini respectively. It was 8 minutes after his introduction that Marouane Fellaini buried Matteo Darmian’s cross in the 87th minute, he didn’t hesitate to go hug the gaffer (Jose Mourinho) to show his gratitude. Truly, as a doubter of Fellaini, I can say Mourinho’s trust in him has seen improvements in his game play, at least we can rejoice in the lack of elbows flying around. United now have one foot planted firmly in the Wembley finals, and with Liverpool losing a goal to nil against Southampton, they will have to pull their best in the 2nd leg in order to face United in the final. As for now the Saints have done themselves a favour by not conceding a goal at home, a result they have to be ready to protect in the return fixture. Liverpool can always take heart in the fact that they play Manchester United this Sunday, so just in case the scousers don’t make Wembley, both clubs can consider this an Old Trafford final. Reviews have been coming in pretty late because of time constraints, but I hope to improve this with coming matches. Till next time, from the man in the red cape.